The Pacific Northwest District of Optimist International returns to a favorite location for the third district meeting of the 2007-2008 administrative year. 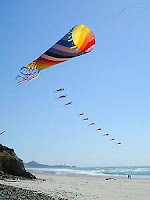 Plan to join Governor Steve Andersen and your Optimist friends in Newport, Oregon on April 25-26, 2008. In addition to the business of the district, this meeting will feature the District Oratorical Contest and winners of the March for Members Campaign. March for Members encouraged your club to host a NOW (New Optimists Wanted) event and sign on new members to your Optimist Club. How many members have you added? Please tell us about your NOW activity by sending us a message. Hope to see you on the coast! 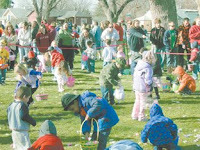 Optimist Clubs throughout the Pacific Northwest celebrated Easter with an annual egg hunt. In Idaho, the Twin Falls Optimist Club offered golden eggs to lucky scavengers. The rare golden eggs contained two one dollar coins. Kudos to the Optimist Club of Vancouver, Washington for using technology to give the Optimist Oratorical Contest a present-day appeal! With the help of the City of Vancouver and cable station CVTV, the contest was recorded and is now available to be viewed on demand at your own computer monitor. Click on the link to watch eight remarkable students speak on the topic "Why me, why not?" Mary White, President, presided over the event, interspersing a delightful Optimist infomercial featuring the great activities of the Optimist Club of Vancouver. Top speakers in the contest were Clareesa Jones, 1st Place; Sonia Jones, 2nd Place; and Ariel Jones, 3rd Place. Optimist International has announced top honors for outstanding service and Gay Enyeart has received the highest award for Optimist leadership by being named Distinguished Governor for 2006-2007. The award recognizes growth in service and membership in Optimist International’s Pacific Northwest District. The District is made up of Optimist Clubs in British Columbia, Alaska, Idaho, Oregon and Washington. 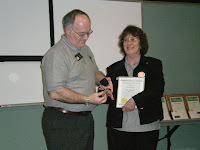 Ken Johnson, Optimist International Vice President, made the award presentation at the second quarter district meeting in Vancouver, Washington. According to Gay, the honor can be attributed to every Optimist Club. “Twenty-three clubs received the Honor Club award. Thank you for giving the highest level of service to the kids in your communities,” Gay told her colleagues as she accepted the award. “This has happened because of all of you,” she concluded. In the picture, Gay's husband Steve Enyeart is shown placing the Distinguished Governor ring on her finger. Congratulations Gay and the 2006-2007 Optimist team including all clubs and all members! The PNW District met in Meridian, Idaho to celebrate the accomplishments of the 2006-2007 year and to make plans for 2007-2008 including publicizing their coming events. One method that is being encouraged by the District Public Relations team is to start your own blog. For more information, contact Linda or click on the ribbon where it reads "Create your blog."